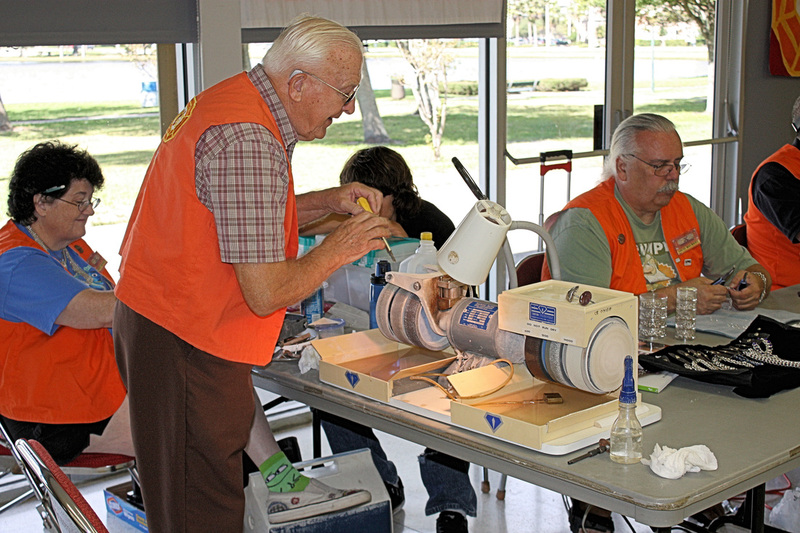 We're a group of friendly people of all ages and experience who enjoy the hobby of lapidary arts. Wikipedia says we’re “artists or artisans who form stone, mineral, gemstones and other suitable durable materials (amber, shell, jet, pearl, opal, coral, horn and bone, glass and other synthetics) into decorative items such as engraved gems, cameos or cabochons, and faceted designs”. We hold an annual Gem & Jewelry show called "Parade of Gems". Through our show we are able to provide scholarships for college students studying Earth Sciences. Help us help them! And enjoy a great show at the same time! Joining The Club & Attending Classes: You must attend a monthly meeting to join the club. One of the great benefits of club membership is the use of our wonderful fully-equipped shop and availing ourselves of great classes taught by members who are volunteer teachers. Once you attend one of our monthly meetings and have paid your annual dues, you may join the club. At that time you may signup to take classes, any class you like, (providing it doesn’t have any prerequisites listed) the old-fashioned way via pen and paper at our meetings. Due to their popularity, some classes take a while to get into so its good to get your name on the list for classes you're interested in immediately after joining. Regarding a schedule, our teachers are all volunteers, so the classes are held as the teachers are available. There is no set schedule or rotation of classes. As the teacher has time to schedule a class, they go through the list of signups for their particular class and contact students from that class list on a first come, first served basis. Some classes are held during the day and some at night. Check out the sample pictures online to see what we offer. Meetings & Dues: Meetings are held at 7 p.m. the first Wednesday of each month at the Henegar Center, 625 E. New Haven Ave., Melbourne, Florida 32901, across from the post office in old downtown (map link at the bottom of the page). Annual dues are only $20.00 with dues for Junior Members costing only $2.00 when accompanying an adult member. Feel free to attend one of our meetings to get a better idea about our amazing club. You’ll meet friendly people, hear interesting information on gemology, get a tour of our wonderful shop, have some great food….and after that, who wouldn’t want to join this club! 1. To promote the spirit of cooperation and fellowship among the membership. 2. To increase our knowledge of rocks and minerals and to explore the mystery and wonders of the earth. 3. To actively encourage members to attend educational classes, workshops, lectures, and demonstrations. 4. To stimulate interest in the earth sciences within the community by providing scholarships to worthy students at all educational levels. 5. To provide the necessary equipment and resources to enable members to develop their interests. 6. To enjoy our hobby and Have Fun! 1. Preserve, support, and promotion of the hobby of Mineralogy and its various forms of allied activities and earth sciences. 2. Dedicate ourselves to the furtherance of the hobby through the exchange of knowledge, experience, and other helpful information among ourselves and other like organizations. 3. To further the education of members and the general public of the hobby by programming talks, discussions, motion pictures, field trips, and the staging of shows and exhibitions. 4. To maintain an active affiliation with the Southeast Federation of Mineralogical Societies and to participate in Federation activities to the fullest extent possible. 1. We conduct classes to enable our members to learn skills to make beautiful creations from all the wonderful gems and minerals found in this great earth. Classes cover all areas pertaining to this hobby, from stone cutting and faceting, to silversmithing and wire wrapping. CMGS is a member of both the Southeast Federation of Mineralogical Societies (SFMS) & the American Federation of Mineralogical Societies (AFMS). NOTE: Our members have the benefit of taking week-long classes each year at SFMS.